Home »Movies»Mind The Gap»Mind The Gap: You Haven’t Seen The Godfather? We at Deadshirt like to fancy ourselves pretty dedicated to popular culture with a combined knowledge of all things media that borders on the encyclopedic, but no one is perfect. There’s just too much music, too many films, too many comics, and way too many television episodes out there. No longer will we have to harbor the secret shame of not having experienced an expected work. Here is where we fill in the missing gaps. This week we look at the film The Godfather, with Guest Contributor Christina Trujillo. 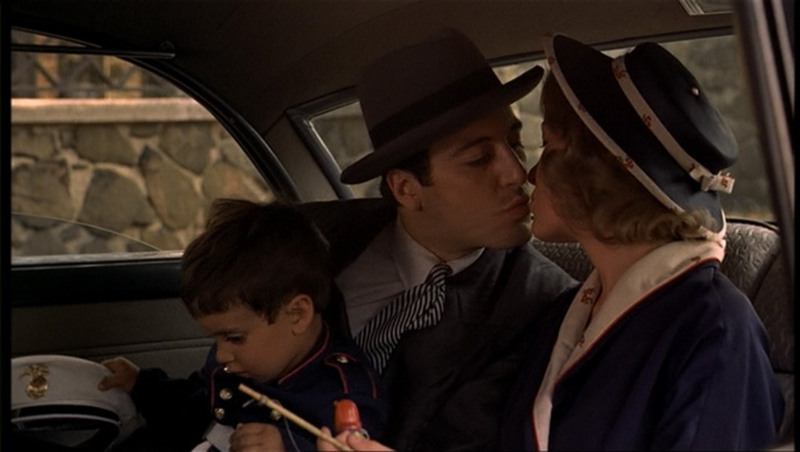 Everyone knows about Francis Ford Coppola’s 1972 film, The Godfather. 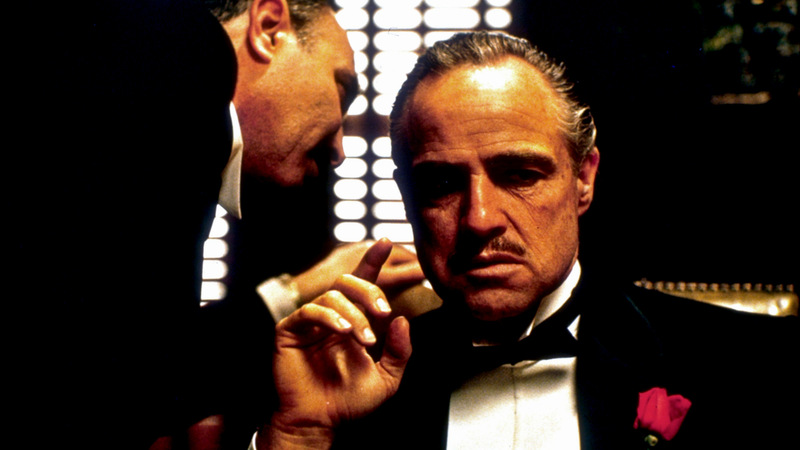 It’s one of those iconic films that spawned parodies and inspired homage to such a degree that you would probably have difficulty finding someone who was not at least passably familiar with the phrase, “I’m going to make you an offer you can’t refuse,” even if that’s more of a misquote than not. The Godfather has sunk into the psyche of filmmakers and filmgoers to such an extent it felt vaguely sacrilegious to have reached my age without having seen the movie. So, I sat down and decided to fix the glaring gap in my pop culture knowledge. Going into this movie I expected dramatic shoot-outs and lots of Italian opera music. Like the iconic lines of the film, the musical score is also recognizable and widely used or alluded to by other films and TV shows. I was pumped. This was going to be a poignant, deep look into the life of an organized crime family. It was all of those things, true. What I didn’t expect was literally everything else that came with the movie, like the frustrating lack of distinction between the characters, the sweeping scope of time the film covers, or the sheer beauty of the cinematography. To properly discuss the film key parts of the plot will need to be addressed, so beware spoilers ahead. The Godfather follows the Corleone family from the moment Connie Corleone is married to the moment Michael Corleone takes up the mantel of the family business. After sitting through the first thirty minutes focused on nothing but Connie’s wedding and all the politics and power shifts happening behind the scenes while she and her new husband dance and party with guests, it becomes very clear that this movie is going to be long. Three hours and twenty minutes, to be exact. Even by our newer standards of film length, that’s a very long time to expect to keep your audience captivated and satisfied with what they are viewing. The introduction does a good job of showing us who the main players of the film will be. We meet Don Vito Corleone, played by Marlon Brando, and we meet Tom Hagen, played by Robert Duvall. The movie starts out with a long speech given by a very nervous father to the two men. The father is presumably one of the guests for Connie’s weddings and unimportant past this moment. 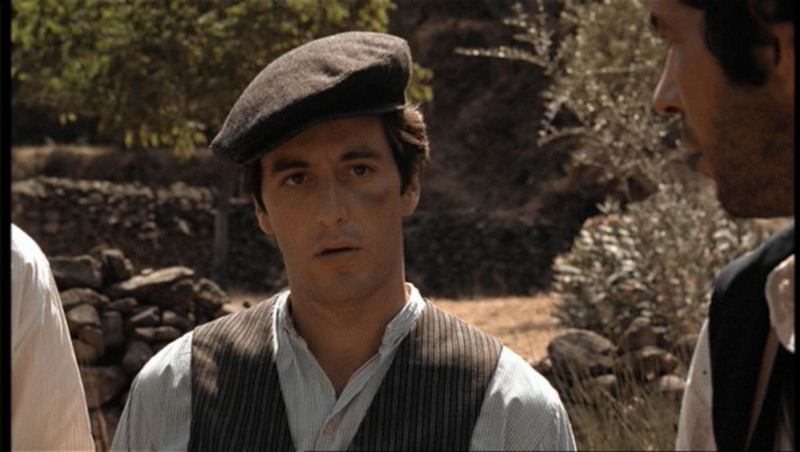 He asks Don Corleone to help him after explaining his romanticized ideals about living “as an American” and the sort of protection and security he thought being an Italian immigrant in America should grant him and his daughter. We learn through this character that the world—particularly the New York area where the Corleone family operates—is unjust and in order for this man to get any true support for the terrible wrong done to his daughter he must come to Don Corleone. Right away I was impressed with how quickly we have it established that Don Corleone is powerful—he gets a big star to come and sing for his daughter’s wedding because the big star owes his career to Don Corleone—but we also get that Don Corleone is also a terrifying man as we watch one of his guests stand outside his home and practice the speech he plans to make to Don Corleone while shaking and stuttering in fear. 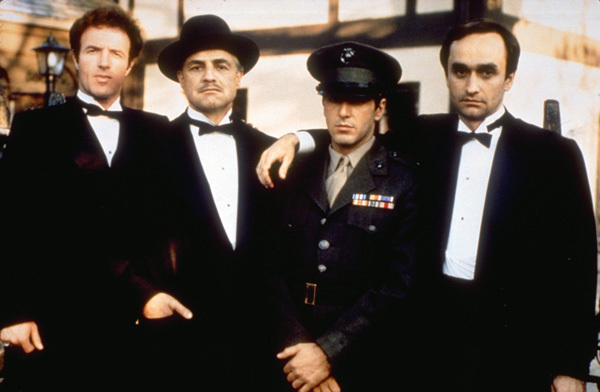 This is the picture of a mafia family that has permeated every movie that came after it. They are restrained in their violence, they help the people who respect them, they are the law outside of the law and so we are kind of confused by Michael’s reluctance to be part of his family and more surprised by his reluctance to include Kay in their world. That’s about the moment where the character interaction fizzles out for me. We have such a large family to focus on, and so many movements occurring around Don Corleone and Michael—our two point characters—that it was hard to care about anyone in particular in the movie. 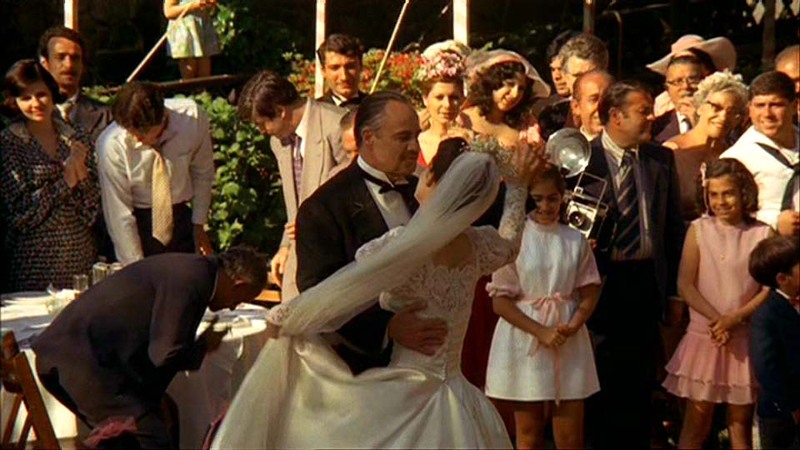 Sure, Don Corleone gets shot and everyone on screen reacts with shock, sadness, and fear, but we’ve only had him in the movie long enough to know he won’t refuse a request on his daughter’s wedding day and he is opposed to selling drugs—shooting people, extorting them for gambling debts, those things are fine, but drugs? Drugs are bad, mmkay? So, with the patriarch of the family effectively removed from the major plots of the story, we now have Michael as our guide. We follow his arc, we watch him drift away from Kay, we watch him commit his first murder, we even watch him step into his father’s shoes when the time is right, but there are so many B and C subplots going on that we don’t really get more out of Michael than a fuzzy outline of a character. While all this is happening, people are being shot in cornfields (“Leave the gun, take the cannoli” was possibly one of the best lines ever spoken in this movie), men are strangled in backrooms, and Connie’s marriage goes violently south. Sonny Corleone, a largely unimportant and unclear as far as his position in the family is concerned, starts a war between the other mafia families, a third brother (Fredo) goes off to Las Vegas, Michael gets married and then becomes widowed in about three scenes. There is just too much happening to fully connect or fully care about any of the characters. Even when someone we kind of, sort of know is killed, or one of the Corleones orders the death of a “family” friend, I couldn’t for the life of me tell why these people were being killed or if they were characters we were supposed to mourn. 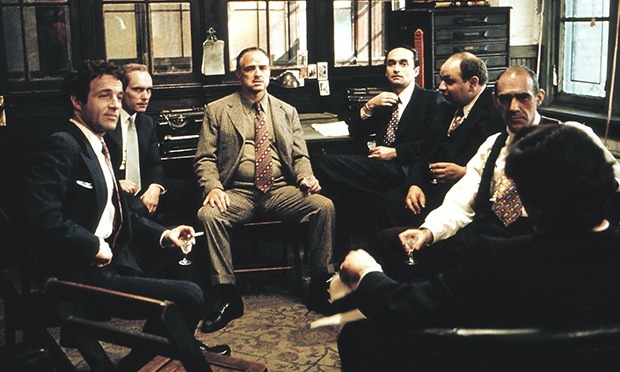 The film is based on a substantially large novel by Mario Puzo, and while the source material was able to build these characters up over hundreds of pages the movie did not have the same space to manage the same effect. It’s the Harry Potter movie syndrome: the characters are only half formed on the screen, recognizable in their entirety only to those who have read the books and have the background needed to fill in the blanks. That said, this was still an excellent movie, you just need to go into the experience for something other than characters. Visually, The Godfather is breathtaking. Every single moment has a precision to it, a hand-crafted feel present even in outdoor and panoramic shots of wild nature. Nothing is out of place, and that control is clear from the first moments of the film. It helps garner forgiveness for the lack of characters to attach yourself to as an audience because it becomes clear that Coppola isn’t making a movie about characters, he’s making a movie about symbols. The characters are vehicles through which we as viewers get to watch the corruption of innocence and the beauty of destruction. Michael spends a good third of the movie with a black eye, ostensibly caused by the police chief’s punch (the first mark he receives in direct service to the ‘family”) that then lasts for the entirety of his exile, only to vanish when he returns home to Kay. Why? It’s not like someone forgot to wipe the make-up off his face after the scene was over. It’s there for a reason, to drive home a symbolic point; the beginning of the tainting of innocence. The black eye after the police chief punches Michael. Time passes, the black eye is still there. It’s that symbolism that makes the movie great and, I would argue, the reason that it has stuck around in our collective minds for so long. Nothing is meant to be over the top, because the nature of the story itself has enough drama. It doesn’t need any help. Music is largely used as transition in this film and even in scenes of extreme violence, like Sonny’s death, blood is used sparingly. If this movie were to come out now I’m not sure the same restraint could be expected. We’re too used to pools of blood after a fire fight, too used to musical cues explaining what we are supposed to be feeling in any given scene, that the resulting product would likely come across as melodramatic and over-acted. The single most amazing sequence in the entire film, the baptism of Connie’s child, is worth watching the three hours that come before it. At that point the timeline of the movie was, for me, all over the place. People have children that are three years old seemingly out of nowhere, marriages have presumably taken place, new faces are littering the background of scenes, and if you were interested in what was going on with the interior lives of the characters (say, for example, what ever happened with Connie and her husband’s relationship after that one phone call?) you would be rather frustrated at this point. The closest we get to knowing how anyone is feeling or what anyone is thinking is Michael, and he’s become as unknown to the audience as well as his own family at this point. None of that matters. By now, you don’t care about that stuff. You care about the baby as baptismal water is poured on his head and you care, a second later when the scene shifts, about the assassins each wiping the sweat off their brows. You care about the perfect moment of unity between a scene of life and the scenes of death. You care about the glass shattering during each murder, tying them all together and preceded by a shot of unbroken, flawless stain glass church windows. You care about Michael swearing off the devil’s temptations as the elevator doors slide shut and the last body hits the floor. It’s perfect, it’s subtle, and it’s the sort of thing that sets this movie apart. I can’t say that I particularly liked The Godfather, but that wouldn’t stop me from recommending it. Anyone who’s watched a mobster themed movie in the last forty years owes it to themselves to watch this film. In a way, it’s kind of become that background information needed to fill in the missing pieces I spoke of earlier. 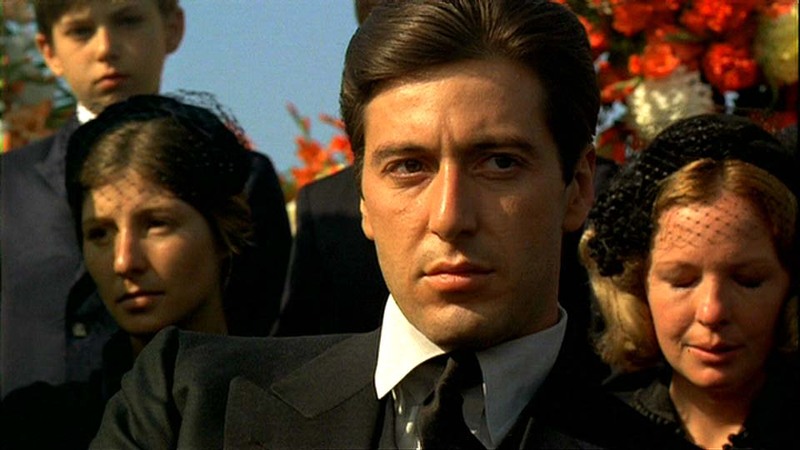 You don’t necessarily need to have seen the movie—just like you don’t necessarily need to have read Mario Puzo’s novel before watching the adaptation—but once you do, you’ll see The Godfather’s influence everywhere. Christina Trujillo grew up in California and moved to New York to pursue a master’s degree in Creative Writing at Sarah Lawrence College. When she is not writing, Christina teaches College Writing and works as the Academic Resource Coordinator for the Learning Center at Purchase College.